Kraftvoller melodischer Gesang und rockige Gitarren. Nickelback Fans kommen mit diesem Album auf jeden Fall auf ihre Rechnung. The Veer Union nehmen ihr Fans auf eine musikalische Reise mit. Durch eine Achterbahnfahrt der Gefühle welche die Ereignisse der letzten Jahre im Leben der Band widerspiegeln. Das Vancouver, BC based act The Veer Union released their newest slab of guitar driven melodic rock entitled „Decade“ on January 29, 2016 through Pavement Entertainment. On December 11, 2015, Revolver were premiering the video for the single ìDefying Gravityî and the iTunes pre-order went live that day with instant gratification of the same track. 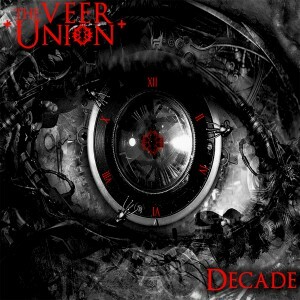 2016 marks the 10 year span between The Veer Unions‘ first album „Time To Break The Spell“ (2006) and their brand new release appropriately titled „Decade“. This marks 10 years of The Veer Union and their struggles of overcoming adversity and follows the highly successful 2012 release „Divide The Blackened Sky“. Lead vocalist Crispin Earl took a rather unique approach to coincide with the concept of the new album „Decade“. He took the opportunity to take 5 unreleased songs which were written before the first incarnation of The Veer Union 10 years ago, and bring them back to life. 5 brand new songs were also written for this new album bridging the span of over a DECADE proving that The Veer Union can stand the test of time. By incorporating the original vision of the band and blending it with the current incarnation, „Decade“ truly takes the listener through the musical and emotion journey that represents all that is The Veer Union. Crispin, like many other musicians, has struggled with depression over the years. Despite his internal battle he continues to persevere through life and his musical journey, which is what the leadoff single „Defying Gravity“ lyrically signifies. The album was self produced by Crispin in order to oversee every aspect of the recording and emotion involved in the making of the release. It has taken „The Veer Union“ 4 years to rebuild and form a „New Union“ with new members Ryan Ramsdell (Rhythm Guitar), Dan Sittler (Lead Guitar), Touring Drummer Tyler Reimer, and Amal Wijayanayake (Bass/Scream Vocals). The Veer Union is now ready to take 2016 by storm with a new album, new outlook, and new fire burning inside them.